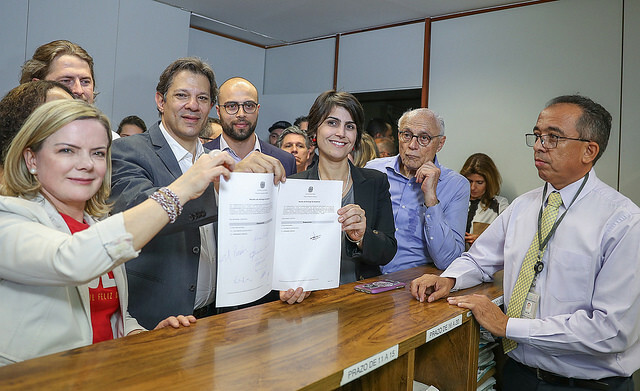 The registration of ex-president Luiz Inácio Lula da Silva as the presidential candidate of the Workers’ Party (PT) was published in Brazil's Official Journal of Courts on Aug. 17. After that, other parties had five days to file challenge petitions in the Supreme Electoral Court (TSE). Eight petitions were filed in this period by the Public Prosecutor’s Office, parties, electoral alliances, and candidates, while eight petitions were filed by voters. Now justice Luís Roberto Barroso of the TSE will review both the registration and the challenge petitions. Lula’s defense attorneys had seven days starting on Aug. 22 to present arguments for the country’s top electoral court to allow the ex-president to run. By the end of that deadline, the TSE may find it relevant to listen to witnesses that may be appointed by the defense in four days, or even request the presentation of evidence in five days. A new five-day deadline would start after that for the plaintiffs to present closing arguments. The chair of the Workers’ Party, senator Gleisi Hoffmann, said her party plans to present a defense at the deadline – that is, Aug. 30. Based on Brazilian law and the United Nations Human Rights Committee’s request for the Brazilian State to ensure Lula’s participation in the elections, Hoffmann said the PT is feeling optimistic. Justice Barroso will then have to rule on the case himself or submit it to the full court. Should the top electoral court challenge his candidacy, Lula’s defense may file appeals with the TSE itself and with the Supreme Court, and he may be able to run while his case is under trial. According to expert in election law João Meira, the Brazilian law allows candidates to enjoy all political rights while their cases are pending challenge in electoral courts. He says “there are no legal grounds” to prevent these candidates from running just like candidates who do not have their candidacy legally challenged. The law states that “candidates pending challenge may carry out all election campaign-related activities, including recording radio and TV ads and having their name on the ballot,” and their votes will only be determined as valid or not after higher courts rule in favor of their candidacy. Meira explains there are three possible scenarios after the electoral court rules on Lula’s case. If the TSE decides to bar the ex-president’s registration by Sep. 17, his electoral alliance may appoint another candidate for the ticket. Not only that, Meira says there is a third scenario, in case Lula wins the election but the top electoral court bars him. In this case, the president of the Chamber of Deputies would take over and have to call a new election in 90 days. Other candidates that had their candidacy challenged were right-wing Geraldo Alckmin and far-right Jair Bolsonaro. EDITORIAL | Why do we defend Lula's right to run for president?